Do you want side-by-side accommodation? Can I bring my television? Homair Vacances specialises in family holidays. Its accommodation and facilities are specifically designed for families (parents and children). √ clear information on which to base your choice of destination: region, theme, accommodation, entertainment and activities, itineraries, tourist excursions, regional events, etc. √ very simple-to-use tools to help you make your choice: search engine, map search, holiday ideas, etc. The availability of our accommodation can be consulted in real-time on the internet (www.homair.com) via the homepage or via the selected campsite's page. Booking according to your individual preferences: freedom to book any stay of 2 nights minimum (weekends, short stays, other lengths of stay). Booking by the week: to book a stay from Wednesday to Wednesday or from Saturday to Saturday. In peak season (from 06/07 to 01/09), stays of 7 days minimum if arriving on a Saturday, and 10 days minimum if arriving on a Wednesday. For stays of a minimum of 2 nights, you have the option of departing on Sunday between 5pm and 7pm (except from 06/07 to 01/09/2019), provided that you have specified this at the time of booking (in campsites Carnac - "Les Menhirs", Houlgate - "La Vallée", Port Grimaud - "Les Naïades", La Ciotat "La Baie des Anges", Torreilles-Plage "La Palmeraie", St-Nic "Le Domaine de Ker'Ys", Les Mazures "Le Lac des Vieilles Forges", Lit-et-Mixe "Le Soleil des Landes", Proissans "Le Val d'Ussel", Régusse "Les Lacs du Verdon", Cheval-Blanc "Les Rives du Luberon", Vendres-Plage "Les Sablines", Champigny-sur-Marne "Paris Est", Mirepeisset "Le Val de Cesse", Cadenet "Le Val de Durance", Ste-Lucie-de-Porto-Vecchio "Acqua e Sole", Ghisonaccia "Marina d'Erba Rossa", Solenzara "Sole di Sari", Saint Florent "Kalliste", Marseillan-Plage "Dunes et Soleil".). The prices indicated are valid for the current season in Euros, inclusive of VAT. * The hire of the mobile home you have booked (regardless of the number of persons in the hired accommodation). Please note: the number of persons must never exceed the maximum capacity of the mobile home. * The provision of blankets and pillows. * The consumption of water, heating and electricity. * Parking space for one vehicle per hired accommodation (at most campsites – not necessarily on the accommodation plot itself). * Access to all the free services, entertainment and facilities at the campsite. * The dossier handling fees. * The cleaning of the hired accommodation at the end of your stay. * Holiday taxes and potential rubbish collection charges, which are to be settled upon your arrival. * The minimum deposit of €170 (1 payment of €100 and 1 payment of €70 by cheque, in cash or by bankcard). * The extra options, such as a second car, a trailer, a dog, the purchase of a set of disposable sheets, the hire of a baby kit, bicycles, a safe, etc. * Deposits for a magnetised access card where applicable. * The charge for a wristband for the swimming pool and/or entertainment activities. * Transport to the campsite. To view the various types of mobile homes available, you can click on the 'accommodation' page of the selected campsite. You can view the inventory of your mobile home in the following section ('Points to note before your arrival'). It is not possible to choose the location of the mobile home. Our company does not offer this option. The individual arrangements at the campsite and our booking software do not enable us to offer this service to our customers. Homair Vacances offers mobile homes for hire at the campsites featured on the website www.homair.com. It is also possible to book accommodation plots in some campsites. Information and bookings exclusively by telephone at 0844 369 0003 (from England), +33 442 16 89 91 (from other countries), except for La Ciotat, Ghisonaccia and Cagnes sur Mer (bookings directly with the campsite). If you wish to book several mobile homes for the same dates, you should make individual bookings on the internet or by telephone. Dossier handling fees are charged for each booking. Our company cannot offer you the option of choosing the location of your mobile home(s) in advance. Unfortunately, the individual arrangements at the campsite and our booking software do not enable us to offer this service to our customers. Homair guarantees you side-by-side accommodation before the 22/01/2019, subject to availability. Offer only available for two 7 nights stays (minimum) booked at the same time, in the same campsite and in 2 identical mobile homes. This offer is not available on all campsites. Warning: The booking must then be made by telephone, and you must indicate this request at the time of booking. Book your stay easily and quickly on the internet. Our website www.homair.com is the simplest and quickest way to book your stay, with real-time information on availability and a secure payment system. You can also book by telephone at 0844 369 0003 (from England), +33 442 204 725 (from other countries). You can find information on the prices and the booking stages. If you already have a customer account (username + password), you will be asked for this information while booking. You will then be able to view the various stages of your booking, your instalment plan and your documents (booking coupon, purchase receipt, invoice 11 days before the start of your stay, and confirmation once you have completed your stay). If you do not have an account, you will be able to create one on the website. For further information, please visit the 'View and keep track of my booking' page. Once you have booked your stay, you will receive a confirmation email (booking coupon, instalment plan or purchase receipt if the stay has been paid for in full). A booking (dossier) number will be indicated on the documents. You will be asked for this number whenever you contact Homair Vacances by telephone or email. Once you have paid for your booking in full, we will send you a purchase receipt by email. You must present this purchase receipt to the Homair representative upon your arrival (between 3pm and 7pm). All the occupants of the mobile home must be indicated on the purchase receipt. From january to june : Monday to Friday between 8.30am and 7.30pm, on Saturdays between 9am and 6pm and on Sundays between 10am and 5pm. July and august : Monday to Friday between 8.30am and 7.30pm, on Saturdays between 9am and 6pm and on Sundays between 10am and 4pm. From september to december : Monday to Friday between 9am and 5pm. If you already have a customer account (username + password), you will be asked for these details when you book by telephone. If you do not have one, our booking centre will suggest that you create one. For further information: please visit the 'View and keep track of my booking' page. Once you have booked your stay, you will receive a confirmation email (booking coupon and instalment plan). A booking (dossier) number will be indicated on the documents. You will be asked for these details whenever you contact Homair Vacances by telephone or email. When you have paid for your booking in full, you will automatically receive a purchase receipt by email. If you do not have an email address, it will be sent to you by post. - Your bankcard number, if you have chosen this means of payment. it is easy, quick and fully secure. You do not need to send us your booking application, and you benefit from a discount in the dossier handling fees (except if no automatic standing order is set up). Direct debiting of the amount will occur on your bank account on the following day. Important: When paying by bankcard, you will be directed to the secure website of ILD – HOMAIR VACANCES' banking partner via its secure platform. The server is encrypted, and all transmitted information is encoded. When paying in several instalments, if the expiry date of your bankcard is prior to the deadline for payment in full, you must contact us when you receive your new bankcard to give us the new number of your card, its security code and its expiry date (failure to do so will mean the instalments due cannot be honoured and the booking will be cancelled). Please note that this means of payment is not possible for bookings made less than 15 days before your stay (bookings to be made by bankcard only). If you choose an option by telephone or over the internet, we must receive your booking application within 5 days, accompanied by your payment. Please write your dossier (booking) number and your customer number on the back of each cheque. Mailing address: Homair Vacances - 570 Avenue du Club Hippique - Immeuble "Le Derby" - 13097 - Aix en Provence Cedex 02. • by bank transfer(s): Exclusively for those residing outside of France. If you choose an option by telephone or over the internet, we must receive your booking application within 5 days, accompanied by payment. your dossier (booking) number, your customer number (beginning with the letter 'I'), the name of the person who booked the stay and the name of the campsite. These are compulsory for any booking. • by bankcard: in one instalment or in several instalments by standing order. You only give us your bankcard number once, and your account will be debited on the agreed dates. you must contact us when you receive your new bankcard to give us the new number of your card, its security code and its expiry date (failure to do so will mean the instalments due cannot be honoured and the booking will be cancelled). • by bankcard: in several instalments without a standing order. • by cheque(s): in one or several instalments. • by bank transfer: in one or several instalments (exclusively for those residing outside of France). Please note: these dossier handling fees are only charged once within a season. You can therefore hire accommodation several times within a season without paying them each time. When you have paid for your stay in full (hire cost, dossier handling fees, optional cancellation insurance) over the internet, by telephone or by post, you will receive your purchase receipt by email or by post (as you choose). You must present this document to the Homair representative on the day you arrive at the campsite. You have the option of paying in several instalments (up to 4), for all bookings made more than a month prior to the start of your stay. Possible ONLY for bookings made over 90 days prior to your arrival. Please note: The total cost of your stay must be paid 1 month prior to your arrival date. WARNING: FAILURE TO PAY AN INSTALMENT WILL RESULT IN THE AUTOMATIC CANCELLATION OF YOUR BOOKING, IN ACCORDANCE WITH THE GENERAL CONDITIONS OF HIRE. PAYMENTS MUST BE RECEIVED BY THE AGREED PAYMENT DATE AT THE LATEST. 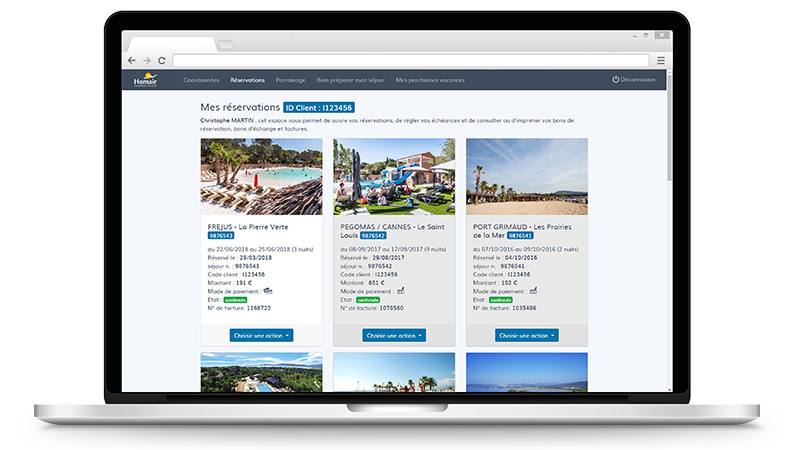 As an option and for a fee, Homair Vacances proposes insurance through its partner, Gritchen Affinity, to cover Cancellation and Interruption of a stay. This insurance, which may be subscribed at the time of reservation of the stay, offers the customer the possibility of being reimbursed by Gritchen Assurance for fees for cancelling his reservation, as indicated in article 13 of the present Terms and Conditions of Rental, in case of the occurrence of an event preventing his departure. This insurance also covers the nights of his stay not consumed, in case of occurrence of an event which delays his arrival or shortens his stay. The events covered are those mentioned in the Terms and Conditions of Cancellation Insurance available at https://www.homair.com/cancellation-insurance. 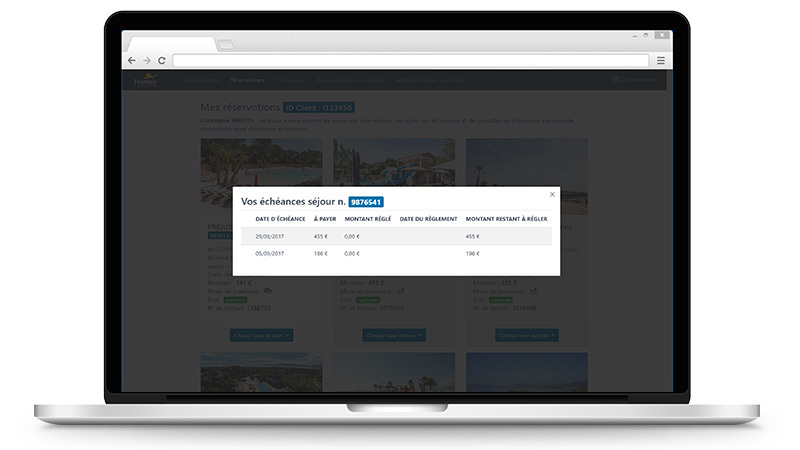 In case of a covered event, the customer must notify Homair Vacances about his cancellation and contact Gritchen Affinity by following the instructions provided at https://www.homair.com/cancellation-insurance, within the 5 days following occurence of the incident, and by providing Gritchen Affinity with the necessary information and supporting documents. At most of the campsites, we offer you baby kits consisting of a high-chair, bathtub and bed with mattress. To get rates, please contact our camping crew. WARNING: booking is compulsory. If you fail to reserve one, we cannot guarantee that one will be available upon your arrival. 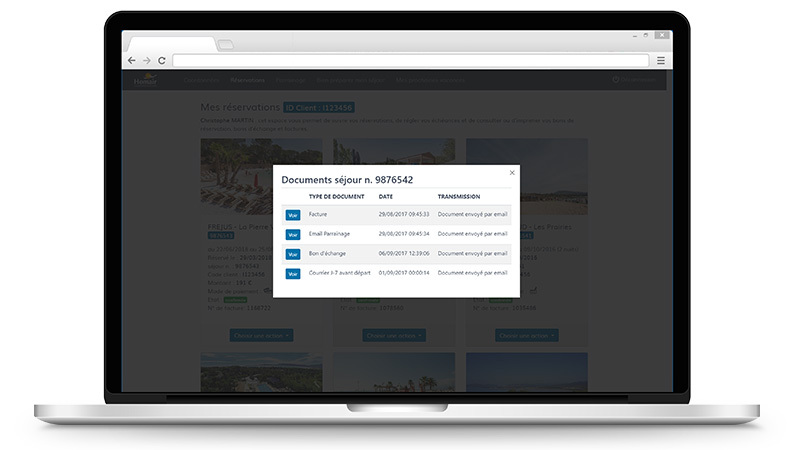 Keep track of and oversee your stay, via your Customer Area. When you make a booking for the first time over the internet, you must create a Customer Account. If booking by telephone, our customer service representatives will create your username and password for you. You can then connect to your account using your username and password in the 'My Account' space. - Paying your instalments: you can pay your instalments by bankcard via our website in the 'My Account' space or by telephone at 0844 369 0003 (from England). Please note: the invoice will only be available 11 days prior to the start of your stay and the confirmation will be available once you have completed your stay. Please bear in mind that it takes 24 hours for the Customer Area to be updated following a booking or payment. You also have the option of modifying your contact details and postal address. The Customer is the sole individual who is legally responsible in relation to ILD – HOMAIR VACANCES, in particular regarding financial terms, and in the event of the cancellation or the partial or complete modification of the stay. or by fax at 04 42 95 03 63 or +33 442 95 03 63 (from outside France). Amendment fee: any amendments (with the prior agreement of Homair Vacances) to the mobile home type, holiday dates or place of stay will incur a charge of 30€ by Homair Vacances. In the case where an amendment incurs an additional cost (with the prior agreement of Homair Vacances), an amendment fee of 30€ will apply and the client will be obliged to pay the supplement. * If the amendment is made 30 days or more prior to the initial arrival date, the 30€ amendment fee will apply and the price difference will be refunded to the customer. * If the amendment is made 29 days or less prior to the initial arrival date, no refund will be made. €30 will be charged for any other modification. If the modification is not accepted, the Customer must complete his/her stay in accordance with the original conditions, or cancel it. Any request for modification which is made 7 days or less prior to the start of the stay (according to the date of receipt of the letter by ILD – HOMAIR VACANCES) will be automatically rejected. Any stay which has started must be paid for in full. No discount will be offered in the event of late arrival or early departure. More than 90 days prior to the holiday: 10% of the total cost of the holiday as well as ancillary costs (booking fees, cancellation cover etc.) will be charged. Between the 89th and the 60th day included before the holiday : 25 % of the total holiday fare as well as ancillary costs ( booking fees, cancellation insurance etc.) will be charged. Between the 59th and the 30th day included before the holiday: 50% of the total holiday fare as well as ancillary costs (booking fees, cancellation insurance etc.) will be charged. Between the 29th and the 5th day included before the holiday: 90% of the total holiday fare as well as ancillary costs (booking fees, cancellation insurance etc.) will be charged. Less than five days before the holiday or in the case of non-arrival: no refund will be made. In any case, booking fees and the potentially cancellation insurance costs are not refunded. then click on 'Forgot your password' in the 'Already have a Homair account?' section. Warning: no arrivals or departures are allowed on Tuesdays. Arrival times are between 3pm and 7pm at all campsites (with the exception of Bonifacio 'Campo di Liccia', which only opens its reception in off-peak season (outside July and August) between 5.30pm and 7pm). Upon your arrival at the campsite, please go directly to the Homair Vacances reception desk. Our Homair representatives will welcome you at the entrance to the campsite in a Homair reception mobile home. Please present your purchase receipt and settle the holiday taxes, the deposits and other charges not included in the hire cost (wristband for the swimming pool and/or entertainment activities, magnetised card, etc.). After you have signed in for your arrival, the Homair representative will entrust you with the keys to your accommodation and the magnetised card for accessing the campsite (if applicable), as well as the inventory to sign. In the event of arrivals outside the allotted times, we cannot guarantee that you will be able to take up residence in your mobile home that evening. We kindly ask that you warn the Homair representative at the campsite if you are running late due to unforeseen circumstances. Their telephone number is indicated on the second page of the purchase receipt, beneath the campsite address. Departures must take place between 8am and 10am (or between 5pm and 7pm, provided that you are departing on a Sunday in off-peak season and you have specified this at the time of booking – see the 'Weekends until 7pm' page). You should arrange an appointment at the reception desk to take care of the departure inventory on the day before your departure, at the latest. In general, these appointments are arranged every quarter of an hour between 8am and 10am (families cannot all depart at the same time; we thank you in advance for your understanding). A minimum hire deposit of €170 (a hire deposit of €100 and cleaning charges of €70, in the form of two cheques if necessary) will be requested of you when you are handed the keys on the day of your arrival. An additional deposit may be requested at certain campsites (magnetised card for access to the campsite, etc.). These deposits will be returned to you on the day of your departure, after the inventory and the checking of the premises has been completed. We reserve the right to retain the cleaning charges (€70) in the event that you do not clean the mobile home yourself, or if the mobile home is not left in a thoroughly clean state on your departure. In the event that you leave outside the hours allotted for the departure inventory, our staff will be the sole judge of the state of the mobile home and may decide to retain the deposit if they consider it to be justified. No compensation claims will be entertained in the event of an early departure. These are applicable at almost all tourist destinations and are levied by the local councils. They must therefore be paid upon your arrival. They can vary a great deal depending on the local authority which sets the rate, those to whom the tax applies (adults and children) and the time period when they are levied. These taxes should be paid either to the Homair Vacances representative or at the campsite reception desk. The amount can vary depending on the campsite, but in general, it is in the region of €0.50 (incl. VAT) per day and per person (this is for guidance purposes only and not legally binding). A deposit may be requested for a magnetised card to use when opening and closing the gate to the campsite. In this event, the deposit will be requested upon your arrival. Campsite regulations are displayed at every campsite. We ask you to consult them, respect them and ensure that all the occupants of your hired accommodation respect them. In order to avoid certain undesired events, such as the theft of your personal belongings, the doors and windows of your mobile home must be locked. Do not leave valuables inside your mobile home. We remind you that HOMAIR VACANCES can under no circumstances be held liable, since it is not a hospitality business and is therefore not accountable under the laws applying to that sector. We encourage you to visit the website of the Ministry of Foreign Affairs to acquaint yourself with the most recent laws which apply to your country of destination. FOR INFORMATION PURPOSES, please be advised that an E111 form must be sought from your social security agency. As is the case in France, you must have a road safety kit (2 warning triangles and a fluorescent vest) in your vehicle. and Sweden (Ireland and the United Kingdom are not members), in addition to Iceland, Norway and Switzerland (which are not members of the European Union). Cyprus, which joined the EU in 2004, as well as Bulgaria and Romania, which joined in 2007, are not yet fully signed up to the Schengen Agreement. You must therefore present a valid passport or identity card to enter these countries; the same applies to Ireland and the United Kingdom. You must be carrying a valid passport or identity card to enter and leave the EU. We advise you to carry one of these two documents with you when travelling in Europe, so that you can provide proof of your identity in the event that you are asked to do so by the authorities. Checks at internal borders may temporarily be in force for reasons of public order or national security. The children accompanying you must have their own passport or identity card, or be listed on your passport. For a tourist stay of less than three months, a valid passport or identity card are required of French and European Union nationals. Entry into and travelling within Croatia with a passport or identity card is permitted up to the expiration date of these documents. All minors must have a valid personal passport or identity card (for European Union nationals), or else be listed on the passport of their parents or of their guardians. For minors who have a surname which is different to their parent(s), it is advised that they obtain a multilingual birth certificate issued by the local authorities of their place of birth. No visas are necessary for the 27 members of the EU: French and EU nationals do not require a visa to enter Croatia. Nationals from countries where a visa is required: any foreign national, whether adult or minor, from the countries listed on the website of the Ministry of Foreign Affairs and European Integration of the Republic of Croatia (http://www.mvep.hr/en/ - also consult the unofficial list on the embassy's website) must make a request in person for a visa at our consulate in order to enter Croatia. Please note: permission to leave the territory is compulsory for all minors who leave mainland France without their parents, as well as a valid national identity card (or passport). WARNING: the information provided here is purely for reference only. We advise you to contact the relevant administrative authorities (local councils, embassies, etc.) in order to acquaint yourself with the latest regulations in force on the day of your departure. In the event that you choose to pay the cleaning fees (€70 incl. VAT), these do not include the washing-up of the crockery and kitchen utensils, which must therefore be left in a clean state. If they are not, you may be charged with cleaning costs. If the hired accommodation is not left in a clean state, €70 incl. VAT will be retained from your deposit. Warning: At FLORENCE 'Norcenni Girasole Club', cleaning costs are mandatory and are set at €25 incl. VAT. We offer you non-woven disposable sheets for €13,50 incl. VAT for a double bed and €8,50 incl. VAT for a single bed (not available in Oléron). This is a practical solution in case you forget to bring your own, or don't have room to bring them with you. The request should be made when you arrive at the campsite. If you bring your own laundry, bear in mind that the pillows provided are rectangular. Remember to bring washing-up cloths, bath towels and bathmats. At the Parc Val de Loire campsite in Mesland, please reserve them in advance. At the Vilanova Park campsite in Vilanova i la Geltru: the cost of these services is higher than the standard price applied by Homair Vacances. At the Marina d'Erba Rossa campsite in Ghisonaccia: the cost of these services is higher than the standard price applied by Homair Vacances - €9.50 for a single bed and €13.50 for a double bed. At the Acqua E Sole de Ste Lucie campsite in Porto-Vecchio, it is also possible to hire 'laundry' sets consisting of fabric sheets and towels (as a guide, the 2010 tariffs were €22 for double beds and €15 for single beds). In general, entertainment is free and open to everyone. Events are organised during the day and/or in the evening, mainly in peak season. You will sometimes be asked to purchase a wristband (at a fixed charge each time or in the form of a deposit, depending on the campsite), which is mainly designed to protect you from people intruding from the outside. It is valid for your entire stay. The use of a barbecue is permitted at certain campsites, as indicated on the illustration . At several campsites, it is possible to hire a gas barbecue (this information is indicated on the illustration in your catalogue and on our website www.homair.com)..
Where it is indicated that a swimming pool is 'heated', this does not mean that it is heated throughout the season. They are not generally heated during July and August. Sometimes you will require a wristband to access the swimming pool (at a fixed charge each time or in the form of a deposit, which will be returned to you when you return the wristband upon your departure). This is compulsory to access the swimming pools and water parks. Boxer shorts, shorts and other clothing are strictly forbidden. Only swimming suits allowed. Campsite and hygiene regulations must be respected. Only dogs are permitted, and this only at certain campsites. If dogs are permitted, only one is allowed per accommodation hire. Before booking, confirm that your pet will be accepted at the campsite of your choice. Do not forget your pet's vaccination records, its collar tag with your address as well as its muzzle for certain categories. Please note that Category 1 dogs are not accepted at any of the campsites. Tariffs vary according to the campsite and must be paid upon your arrival. There are laundrettes or washing machines at all the campsites. Sometimes, you will also find an ironing room and driers. You normally have to pay for these services (either with tokens or coins). In off-peak season, you have the option of departing on Sunday between 5pm and 7pm (instead of 10am), only available on La Baie des Anges, La Palmeraie, Le Ker Ys, Le Lac des Vieilles Forges, Le Soleil des Landes, Le Val d'Ussel, Les Lacs du Verdon, Les Rives du Luberon, Les Sablines, Paris Est, Val de Cesse, Val de Durance, Acqua e Sole, Marina d'Erba Rossa, Sole di Sari, Kalliste, Dunes et Soleil campsites. To take advantage of this free option, you must notify us of this while booking (by telephone, post or at www.homair.com by entering the code D19H). Please note that this option is not available from 06/07 to 01/09 at campsites where bookings are for a minimum of 7 nights during this period (consult the details and the list on the 'Availability' page). In general, the kids' clubs are for children aged between 5 and 12 and the teen clubs are for teenagers aged between 13 and 17, mainly in peak season. Sometimes, there is a fee charged for these clubs. See the illustration on the campsite page . Warning: ages may vary according to the campsite. The presence of a parent may be compulsory at certain campsites. For safety and insurance reasons, you are not permitted to exceed the number of occupants for which each type of hire accommodation is designed. The campsite manager will refuse to accommodate any person over the maximum capacity, even if customers offer to pay a supplement. Application forms must contain the surnames, first names and dates of birth for all occupants (including babies/toddlers under 3 years old). If you have left out a person or persons, you can call our booking centre or send us an email with the surnames, first names and dates of birth of the persons that were left out. The person making the booking must be at least 18 years of age, be legally entitled to enter into a contract in accordance with our General Conditions of Hire, and be able to vouch for the veracity and accuracy of the information provided. Depending on the availability of stocks, you have the option to reserve a baby kit, consisting of a bed with mattress, a high-chair and a bathtub. You must indicate this while booking. The tarif is €4,50 incl. VAT/day and €6 incl. VAT/day at Ghisonaccia - Marina d'Erba Rossa. The booking of a mobile home generally includes a car park area for one vehicle at the campsite (sometimes on the accommodation plot itself). If you have 2 vehicles: the second vehicle must be parked at the campsite car park or outside the campsite (depending on the campsite). The payment of a charge may be requested of you by the campsite management. Warning: In AGLIENTU, no parking is allowed on the accommodation plot. In principle, the setting up of a small tent on the accommodation plot is not permitted. However, some campsites will tolerate it on payment of a supplement. Warning: this does not change the maximum number of persons permitted on the accommodation plot. From time to time, we promote special offers in our newsletters, on our website or by other means of communication. If you have a 'special offer' code, it must be entered in the relevant field at the first stage of your booking (when booking over the internet), or be specified when booking by telephone. If the code is invalid, please check the relevant conditions of the offer and its validity dates. Bear in mind that a special offer, a partnership agreement with your employer or other arrangements are never applicable retroactively. They must be indicated at the time of booking. Our IT system does not allow us to modify this at a later stage. A special offer is not exchangeable for customer loyalty points. Where your employer is concerned, you must enter your 'bonus' code in the same field. For payments by bankcard (whether over the internet or by telephone, debit will occur on your bank account on the following day. By e-mail or by fax. You have the option of viewing and printing your purchase receipt directly via your Homair Customer Area on the website: click on 'My Account', then log on with your username (in most cases, your email address) and your password (which you would have created when you booked on the internet or by telephone if you are a new customer). The address of the campsite as well as the itinerary can be found on page 2 of your purchase receipt. The GPS coordinates are also indicated. You can also find these details on our website www.homair.com, by visiting the page of the relevant campsite. Our mobile homes are not equipped with televisions (except for mobile homes in "La Rive" campsite in Biscarosse and "Le Domaine de Ker Ys" campsite in Saint-Nic). It is sometimes possible to set up your own television. We recommend that you bring an interior aerial so that you can pick up channels. We are unable to provide you with a map of the campsite. Remember that it is also not possible to choose your accommodation plot number. The accommodation plots of the mobile homes are allocated according to our scheduling systems (automatically generated by our booking software) and vary over the course of the season. The accommodation plot of your mobile home only becomes definitive on the day when you arrive at the campsite. - If you have a new bankcard, first of all you need to activate it by withdrawing some money from a cash point before you can use it to make a payment. - Confirm that your bankcard is accepted: Debit card, Visa, Mastercard and Eurocard. - Ensure that the expiry date of your bankcard has not passed. - Check that you have entered the right account number and pictogram. - Check with your bank that your spending limit has not been exceeded. It is sometimes possible that when you have made a large purchase or withdrawal, your card is then blocked for one week by your bank (even if your bank account is in credit). The invoice for your stay will be automatically sent to you by email or by post (once you have made payment in full), 11 days before the start of your stay. A confirmation of your stay can also be sent to you by email or by post, on request and once your stay has been completed. An invoice and a confirmation of your stay can be sent to you on request by post to HOMAIR Vacances – Immeuble Le Derby – 570 Avenue du Club hippique – 13097 Aix-en-Provence Cedex 02, by phone at 0844 369 0003 (from England), filling this request form; or by fax at 00 33 (0)4 42 95 03 63. For persons who are receiving funding assistance for their stay from a particular body and who need an invoice and/or a confirmation of their stay, it is essential that the name of the beneficiary of this assistance appears first on the booking application. This is the information which will appear on the invoice. The name indicated on the invoice can under no circumstances be changed once full payment has been made. Contact our call center on 0844 369 0003 (from England) to get the list of accomodation adapted for persons with reduced mobility. If the reimbursement relates to a payment by bankcard (except one-off payment cards) within the last 2 months, the reimbursement will be made by bankcard. If this is not the case, the reimbursement will be made by cheque. Initially, all claims requests should be made to the Homair Vacances representative at the relevant campsite. The representative may be able to find a rapid and immediate solution for you. Or filling this request form. After this 15-day period has elapsed, no claims requests will be considered. You will receive a reply by post, generally within a month following receipt of your letter.